Jane and I bought a new tandem. Here we are on Route 360 overlooking some juniper trees. 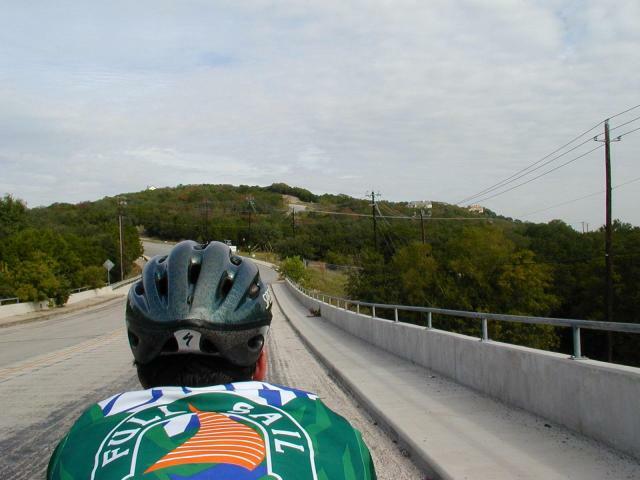 This lookout also overlooks Austin's downtown, but it was 60 degrees, and there was morning fog, so you could not see the buildings too well. 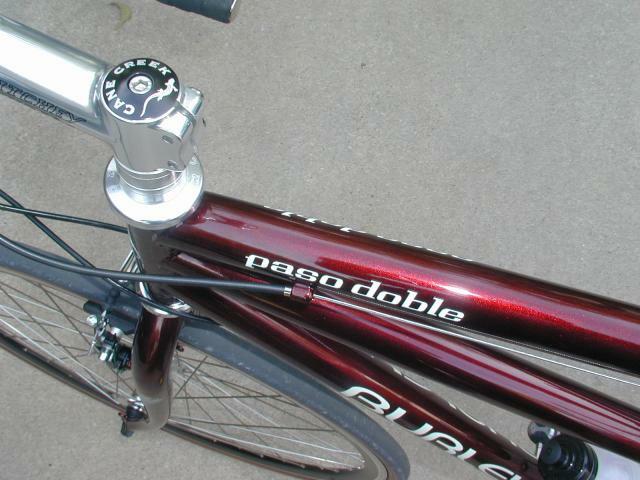 The bicycle is the Paso Doble by Burley. Paso Doble is Spanish for "double pass" which is a Spanish dance something like a tango in which the two partners pass each other. It also is a cute play on words because whenever a tandem passes another rider there is also a "double pass." Tandem bike people love phrases having to do with the number two. Here you see the color which is a metallic cranberry red. This bicycle normally comes in gold, but since they were out of stock, they allowed me to chose any color in the catalog. I love red on bikes, but we now have 4 red bikes in the garage each a different shade. Here we see the beefy headset made by Cane Creek. The Cane Creek logo and salamander are laser etched into the steering tube cap. Cool. The frame material is the new OX-3 chromoly steel which unlike other materials actually gets stronger where you weld it. The tubes are nearly all double butted, and most of them are swaged or ovalized. 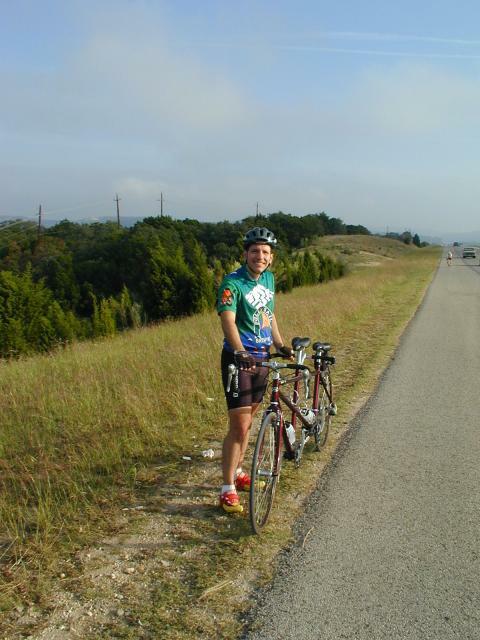 Here Jane is showing the bike off on Loop 360. 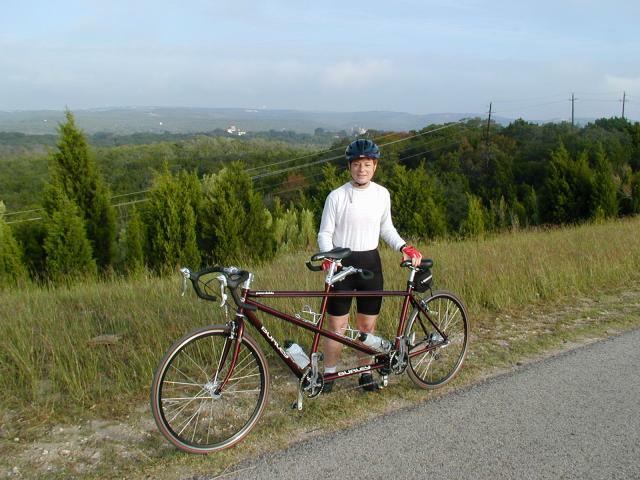 She didn't know she was getting a bike until 12 hours before this ride. A month ago we test drove a tandem and loved it, but I deceived her and said we didn't have the money, and we would have to wait until spring to get it. Then I ordered it anyway. I snuck it into the garage and fixed it up with the pedals and bottle cages. Then late Friday night, I asked her to come into the garage to look at something on her mountain bike. Boy was she surprised to see that behemoth in the garage. 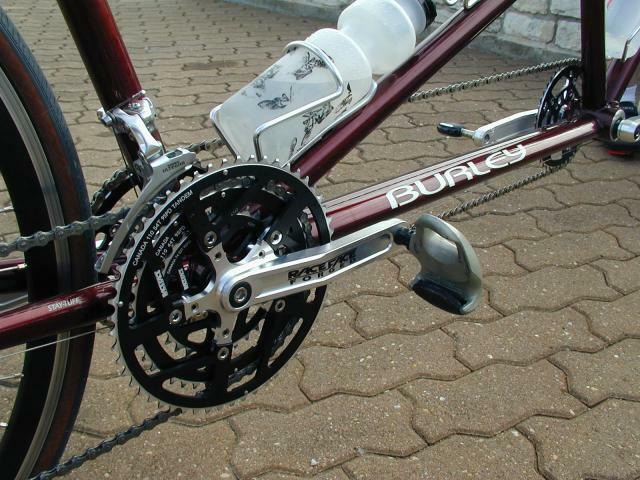 Here is a view of the back crank and drivetrain. 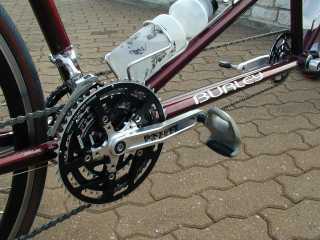 As you can see, it's a triple crank like a mountain bike. That's because tandems are both faster and slower than normal bikes. They are faster on the level and downhills so you need a big top gear. They are slower on the uphills so you need a low bottom gear. I love the look of this Race Face forged crank. Look at the machining that gives the crank a really cool angular geometric look. Also notice the front crank is machined on the hidden side. Finally, notice the cool laser etched writing on the chain rings. Awesome. Jane uses Look pedals on the rear. I use SpeedPlay pedals on the front. Thus we can't ride each other's position! Here I am, happy as a clam. 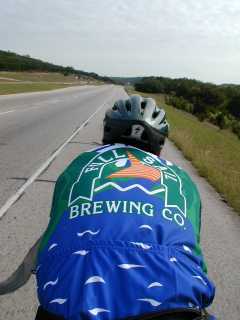 Notice my Full Sail Ale jersey. All my bicycle clothing seems to involve beer these days. Actually I am happy we just climbed the hill in the background. 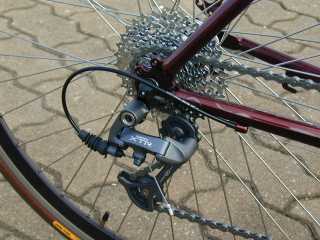 Here's the rear derailer. Notice once again that it's a mountain bike component. The wheels are nice and aero with deep rims and Continental tires. There are 48 spokes per wheel, which is really beefy, as I guess it must be to support the weight of two riders. Unfortunately the chain protector tape is coming off the chain stay. I will have to fix that. Here's the view from Jane's position. Jane can easily ride no hands back there. Other than cranking, she gets to enjoy the view and talk the whole ride. She also performs the important task of signalling the turns. Sometimes I think she puts her feet up on the bars too. The front person is called the captain. The rear person is called the stoker. Here's the other side of that hub. Notice how the cogs are all drilled out and lightened. The spider that holds the cogs is one marvel of parts machining. 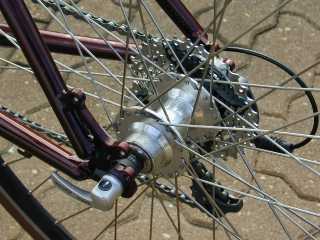 The hub is also threaded on the left side. Why? It allows you to mount a disc brake or a hub brake. That lets you have even more braking power than normal. Now its time to head home, but first we have to climb this hill. This is Bluffstone Drive heading into our development The Great Hills. 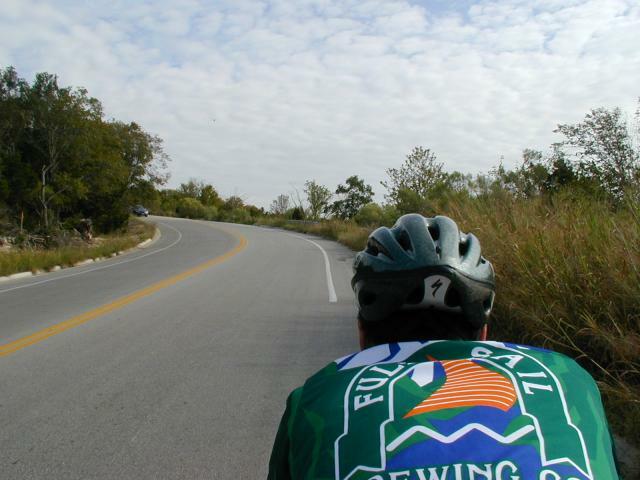 If you look carefully at the hill, you see the road climbing and curving to the top. Now we are in the middle of the climb. This road is steep! Trucks usually have trouble getting up here, so they take a different route. There is a great view off to the right side up ahead. There is also lots of brush and wilderness nearby. I once saw a colorful pheasant cross the road here. Or maybe I was simply oxygen deprived. Anyway, if you can climb this hill, you can climb anything. Luckily with the help of Jane the stoker, we made it to the top. Hooray! Well that's all for now. 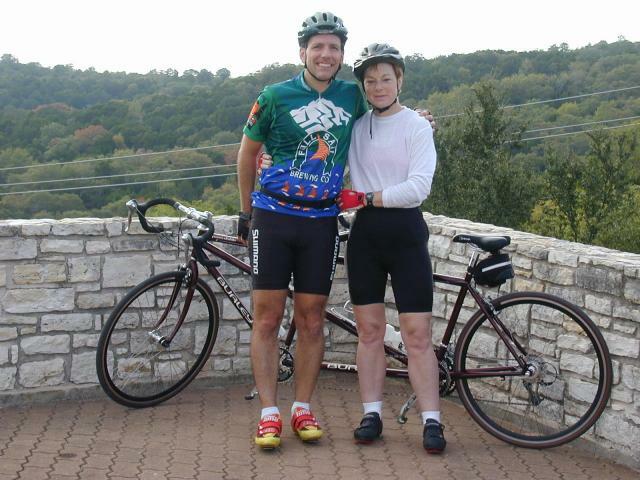 I hope you enjoyed this tour of the new bicycle, and our fun Saturday morning drive. 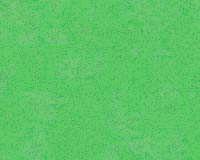 Last modified: Thursday, 09-Jun-2011 13:04:10 MST.